Oh, how I love thee, Internet. I saw this recipe in a magazine - I can't remember which one - like, almost 10 years ago or something. Way before this blog was a twinkle in my eye and way before I even really understood what the Internet was all about. (Er - not that I now have much of a clue, but still. Fiber optic cables! Coal-fired power stations! Personal websites! I am way more informed.) I clipped it and made it and filed it away and then totally forgot about it, only to have an inquisitive reader ask me about it recently (hi, Charlotte!) because she'd read a comment I left on Adam's blog two years ago in which I waxed rhapsodic about said pasta. So! I set myself to digging among my recipe clippings. It embarrasses me slightly that it took me, a somewhat neurotically organized person, more than ten minutes to find the darn thing. In fact, it took me more like a week. * A week in which I desperately emailed Adam (Hadn't I emailed him the recipe? Apparently, I had not.) and had to slowly face up to the fact that perhaps my organizational skills weren't quite what I imagined them to be. And then, of course, ten minutes after telling myself this, I found the recipe, glued sweetly and snugly into some binder page, exactly where it should have been, obviously. After all that effort, I was hungry and, frankly, a little curious. Wouldn't it be fun to see how the recipe stood up, after hiding out for so long? I marched myself out to the store, bought a pound of fettucine and got to work. And it is, just as you might have already imagined from the words "Mario", "Batali", and, oh, perhaps "Pappardelle", "Peas", and "Parmesan", quite tasty. 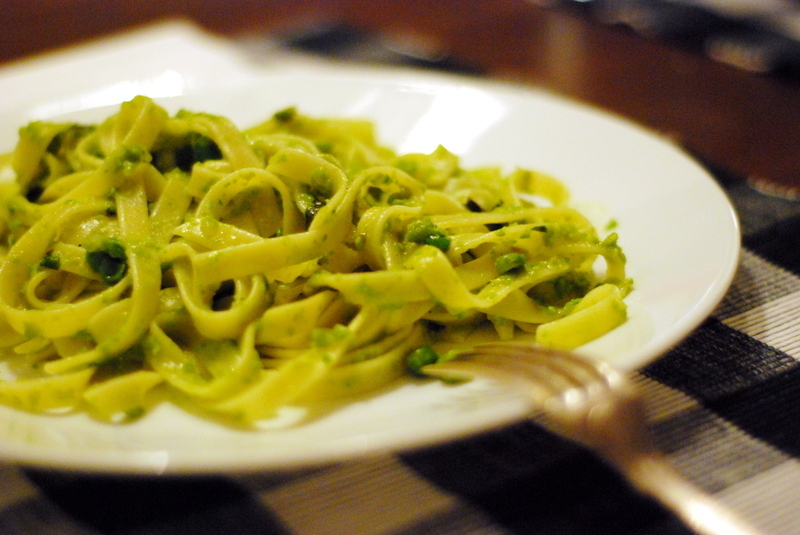 Peas and mint are a match made in heaven, of course, and when you throw a silky tangle of fettucine into the mix and the long strands get all green and velvety from the pea puree and sweet-salty from the honey and Parmigiano, well then, you can imagine your delight at dinner. But there are a few things I have to note, because I strayed from the original recipe ever-so-slightly, and I think you should, too. First of all, watch it with the honey, folks. Mario asks for two entire tablespoons of the stuff, but this makes the dish brazenly sweet instead of delicately nuanced and I think we can all agree that nuance is better than in-your-face sweetness, no? Then, he also says you need an entire stick of butter. And you know, if you're into that kind of thing, by all means toss the whole stick in there. But this dish can do with a whole lot less of the stuff. Also, one more thing, you need to loosen the sauce with pasta water before you toss it with the pappardelle, otherwise you lose precious minutes trying to coat the pasta properly, so that by the time you do and bring it to the table, it's well on its way to being lukewarm. And we all know there is nothing worse than lukewarm pasta. Anyway, this is the story of the little recipe that could, powered by the Internet - it made it into a magazine, into a binder, into a comment section, into an email, and now finally, out to you all. May you all like it as much as I do. *Yes, I tried Googling it, but heavens to Betsy, this recipe was nowhere to be found online. So now it is. Thank God for blogs, wouldn't you say? 1. In a large saute pan, heat the oil until it is just smoking. Add the onion, honey, and 2 cups of the peas, and saute until softened and cooked through, about 10 to 12 minutes. 2. Place peas in a food processor and pulse until coarsely pureed, season generously with salt and pepper, and set aside. 3. Bring 6 quarts of water to a boil and add 2 tablespoons salt. Melt the butter in the saute pan, add the remaining peas, and cook slowly until just softened, 4 to 5 minutes. Add the pea puree to the whole peas and set aside. 4. Just before the pasta is done, pour a ladle of the starchy cooking water into the pan with the pea puree and stir to loosen the sauce. Cook the pasta until al dente and drain well, reserving more of the pasta water. 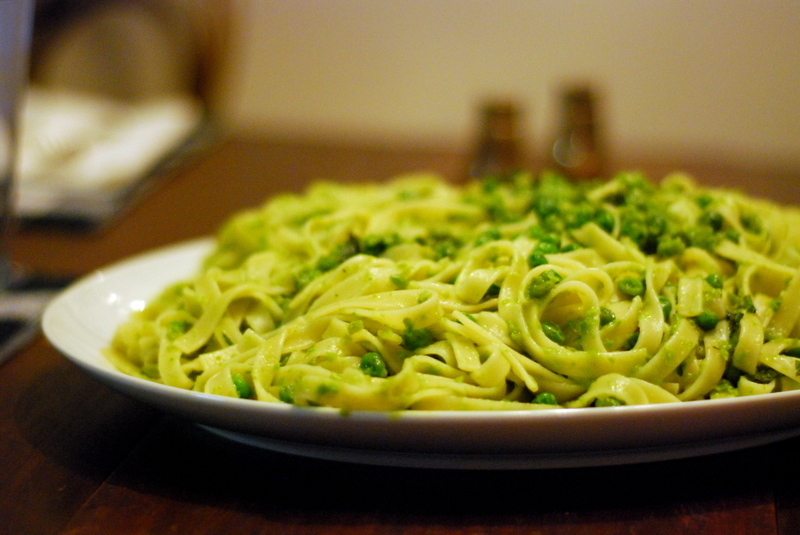 Immediately toss the pasta into the pan with the pea mixture and place over medium heat. Stir gently to mix well, adding a little pasta water to achieve the correct texture, not too dry and not too wet - the noodles should be dressed like the greens of a salad. Add the cheese and mint leaves, and toss to combine. Serve immediately.